Low Sodium & Low Fat, Season it just the way you like it, Makes 24-30 Servings, Gluten Free, Vegan/Vegetarian, Kosher. Stove Top: Add 1 part vegetarian soup mix to 4-6 parts water. Add desired extras and seasonings. Bring to a boil. Reduce heat and simmer for 10 minutes, stirring frequently. Cover, remove from heat, and let stand an additional 5 minutes. Stir gently and serve. Slow Cooker: Mix can be perfectly prepared in a slow cooker. Just add vegetarian soup mix, seasonings, and water directly to the slow cooker. Cook on low for about 4 hours. Our Soup & Chili Mixes are an essential part of trail cooking. You can pre-measure and season the mix, and put proportion size servings in empty Zip Pouches prior to your excursion. Dehydrated Soup Mix can be soaked prior to cooking to reduce the need for fuel. This can be done at mealtime or early in the day to save time during meal preparation. Just open the zip pouch, pour about 1/2 cup water in the pouch, and reseal. When you reach your campsite, simply pour the contents of the pouch into your pot, add the remaining water, and heat to serve. Check out the SOUP COMPARISON CHART. One of our primary goals in using Harmony House dehydrated products is to be able to make right-sized meals without left-overs or waste for two oldsters with some dietary restrictions (not the same diet restrictions for each of us either). A big pot of anything means a boring week of the same meal every day. 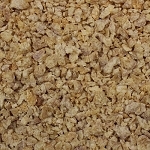 These dehydrated mixes allow you to find the exact amount to make for any person at any meal, without anything left-over, and a different meal the next day. And it's easy to get recipe variety by slightly altering your seasoning, thickening agents, and by adding a bit of broth instead of water, or adding barley, rice, quinoa, or pasta. Or, put some or all through a food processor after heating and rehydrating for a creamy soup or casserole. So, ladies and gentlemen, listen up. 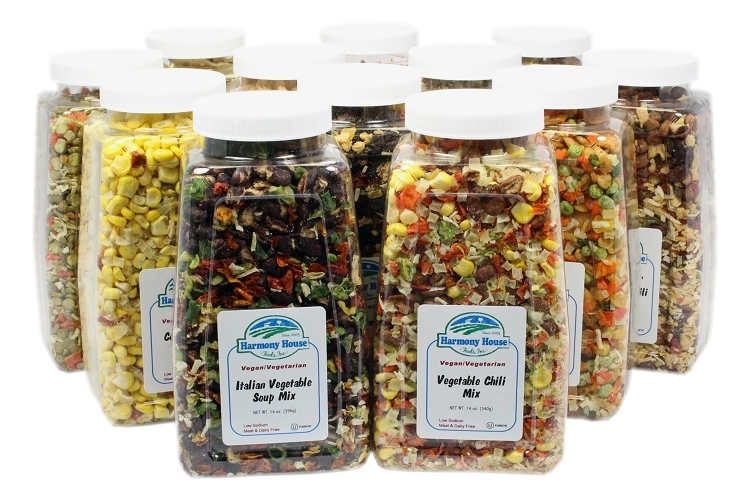 This pantry stuffer selection of plain mixes is the best solution we've found; a pantry full of different ingredient mixes leaving the flavoring and salting (one of the things we must cut back on) to us. Before these plain soup and stew mixes came along, we were trying to create these kinds of mixes on our own. But that meant buying large packages of each of many dehydrated ingredients, and opening them all, as well. Now, we can open two or three 12 oz containers, for a great day-to-day variety, and leave the rest sealed up for the next go around. So far, all of the plain mixes we've tried have been fantastic, and we're coming up with all sorts of creative ways to make flavorful meals that are full of fresh nutritious vegetable flavor, yet fast and convenient to make for one or two people. Look at the nutrition information for nearly every soup option you can find in the grocery store; sodium levels that are off the chart. 600 to 1500 mg per serving are common, and do you really eat just one tiny 8 oz serving of soup? I can't live on that. So, just your soup in one meal will more likely be double that; way beyond what's healthy. Our soups and casseroles are now mostly less than 100 mg for a two cup serving, and with practice, and use of creative no-salt seasonings, they never taste bland. Thanks Harmony House Foods. Great Idea! Our Mars analog crews in Utah are delighted with your unseasoned soup mix sampler in quart jars. The first twelve jars just flew out of the pantry and we are halfway through our second case. There are so many reasons that this product is better for our crews than other long term storage soup mixes with beans. Low sodium and wide variety of course, but there's more. The beans in your products are precooked so they finish at about the same time as the vegetables. When conventional dry beans are used in such mixes, the soup has to cook for 2-3 hours, soak overnight first, or go into a pressure cooker. Less convenient and the veggies get overcooked. But not yours. Finally, your mixes are vegan, kosher and gluten free, which helps us to accommodate people on special diets among the 60-90 "Marsonauts" that we host at the station each year. You have come up with a really good solution for soup mix that solves the three problems of long cooking, over-seasoning, and gluten sensitivity all at the same time. Many thanks for this high quality product line. For detailed nutritional information, please see the individual product pages for the Complete Nutritional Fact Sheets.